BC businesses are increasingly in favour of free trade with China, pipelines and cannabis – and overwhelmingly opposed to mandatory unionization, according to a new survey by the BC Chamber of Commerce. More than 800 BC business leaders responded to the Chamber’s annual survey, sharing their thoughts on their own prospects, how the province is doing, and the challenges ahead. “These indicators can’t definitively tell you which direction the province is going,” says BC Chamber of Commerce CEO Val Litwin. Many of those signs are good. 56% said their own business is good or very good, down slightly from the previous two years – but only slightly. 68% said their mid-range prospects (three to five years down the road) are good or very good – again, down slightly. That said, there are some clouds on the horizon. 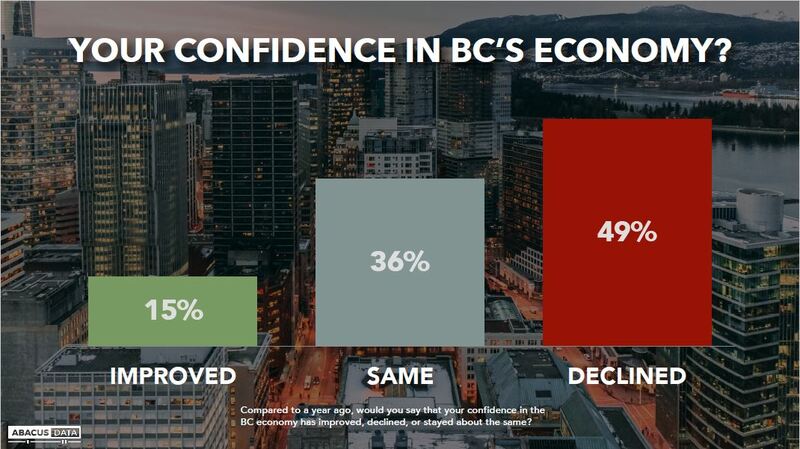 49% said their confidence in BC’s economy declined in the past year. 80% said the cost of doing business increased, and 61% cited a lack of available talent. Most of the numbers are fairly consistent year to year – but there are some recent fluctuations. Just two years ago, 78% agreed that “the provincial government is generally supportive of business.” In 2018, with the NDP in power, less than half (46%) agree. The same question asked about the federal and their local government has seen fairly consistent results all three years. When asked what’s helping their business, respondents most often cited less tangible aspects, such as Canada’s international image, or BC as a tourist destination. What’s hurting business are the basics: the cost of housing, labour cost and shortages, and taxes at all three levels of government. On housing, overwhelming majorities agree that housing is becoming so expensive that it will become difficult to attract new companies (89%) and young people (92%). There are regional differences as well. For instance, only 17% of respondents in the north said the cost of housing was hurting their business – compared to 42% in the Lower Mainland. The survey also revealed some interesting reactions to trade. A majority of respondents reported “neutral” feelings on the Trans Pacific Partnership, the “New NAFTA,” and a free trade deal with China – but also revealed an ongoing evolution of feelings with regard to a theoretical free trade deal with China. As recently as 2016, 58% of respondents said free trade with China would be good for BC – still a majority, but not an overwhelming one. That figure jumped 10 points to 68% in 2017, with another jump up to 72% in 2018. A related question – “a free trade deal with China would be good for my business” – saw a similar transformation, going from 42% in 2016 to 55% this year. 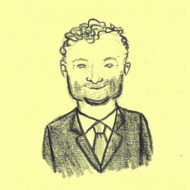 “Trade with China is a subject that’s seen the most change over the past three years,” says Litwin. It’s worth noting this survey was conducted before the arrest of Huawei’s CFO in Vancouver, and so opinions may have since shifted. 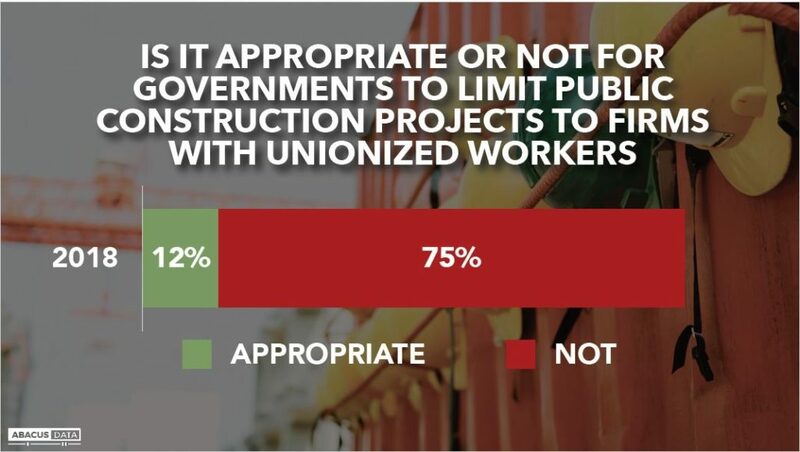 On the question of limiting government construction projects to select unions, businesses overwhelmingly agree – fully 75% say it’s not right. This is consistent with public opinion in general, including a poll done for The Orca in September. Overall, the BC Chamber describes the results as a positive mood, but with more stress, and some concerns about the relationship between business and the NDP government.